The Grounded Beauty products are developped not only for the beauty line but also for the many health advantages! Because of the high amount of silver in the Minitopper and the pillow case not only is the conductivity and the longevity better but also is the antibacterial activity of the silver much higher than in traditional grounding sheets. And because the conductivity is so much stronger both products can be put underneath your own fitted sheet or your own pillow case. The Grounded Beauty Earthing Minitopper and Earthing pillow case are connected to the Earht with a connection cord to ground your body during your sleep. This is the ideal time to ground your body, because your sleep is the best time for your body to restore. This is a natural way to improve your self healing capacities. Sleeping grounded reduces immediately stress in your body, improves your blood circulation, reduces inflammation en improves sleep, to feel better and look better. 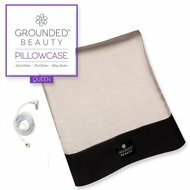 A Grounded Beauty Earthing pillow case can help with jaw, neck and shoulder problems. We advise to use it in combinaiton with an Earhing Minitopper or a Silver Undersheet. Earthing pillow case with connect..
Earthing pillow case (80x50cm) with connection cord only to ground yourself while you are sleeping. Especially for cheek, neck, and shoulder problems.